Both Canadian and Québécois, part anglophone and part francophone, with one foot in the past and the other firmly in the future, Montreal is a city that defies easy categorization. My friend Adam Gollner is on the phone, talking fast and describing the plan. Actually, it’s a series of plans. Or, more accurately: a jumble of narrative fragments, promising leads, and meandering enthusiasms that, taken together, will form the big mosaic picture of everything I need to know about Montreal. Gollner is precisely the type of person you’d want piecing together such a mosaic. A funny writer, the author of a beautiful and odd book about food and obsession called The Fruit Hunters, he is a Montreal native and committed explorer of the near at hand. He is someone who is not averse to spending 20 minutes on the phone explaining the history and provenance of a particular Portuguese rotisserie chicken you need to try, plus the strategies for placing an advance order and staging a picnic—only to call back five minutes later with directions to an alternate Portuguese chicken shop that has superior french fries. In other words, he’s an ideal guide, not just because he has the lowdown on how the grill men at Rotisserie Portugalia actually learned their poultry skills in Angola during the war for independence, but because he is a tireless seeker of such stories. And because he knows that no matter how many details you collect, Montreal, like any great city, resists being fully known. So our plan for the next day is to drive from neighborhood to neighborhood, from the coffee shops and markets of Little Italy to the outlying Middle Eastern quarters of Villeray and Ville St.-Laurent. Leaving behind the pretty but well-traveled areas of the old stone port and Vieux-Montréal, we’ll wander and see how the living city is stitched together. “When you realize you can never quite get a hold on this place, that there are always these hidden pockets that surprise you,” Gollner says, “then I think you’re getting at the magic of Montreal.” Plus, there’s a sujuk sausage sandwich he thinks I need to try at a Lebanese grill joint on the outskirts of town. For now he’s urging me to take a walk up “The Main,” or Boulevard St.-Laurent, the traditional dividing line of the city, separating Montreal’s east and west sides. Walk up through the remnants of the Jewish section, past Schwartz’s, up past the slick bars and boutiques to where the cruddy curio shops meet the Portuguese bakeries around Rue Rachel. Rotisserie Portugalia is a block to the west. Romados, the place with the good french fries, is a couple blocks east. Walk the chicken over to the park in front of Mont-Royal for a picnic lunch in the sun. There is one problem: snow. I’d flown out of New York under warm, clear skies and landed an hour later in a freak late-spring snowstorm. The picnic will have to wait. I like to think of cities as conversations. First you hear the simple layered cacophony of so many people talking to (and at and over) one another. Then there are the wider dialogues—between its buildings and nature, between planning and chaos, between the urban fortress and the world outside its imaginary walls. A visitor listens in on the chatter, on the racket a city makes—the hum of its hive—and is engaged in this never-finished conversation about what this place is. I take the unseasonable snow as an admonition from the city, a not-so-subtle reminder: It’s not all fun and games here. Je me souviens, goes the motto of Quebec, printed on all the license plates: I remember. And while nobody agrees on what precisely Quebecers are meant to be remembering, there is a shared awareness here, a respect for the collective memory of hardship in a cold, remote province at the northern edge of North America. Winters are long, dark, and brutal. In the warm months, Montrealers take to their parks and waterfront activities and outdoor amusements like Swedes worshipping the vernal equinox. And for the same reason: the break in the season brings life, sanity, exultant release. Late on my first night in town, I peek out my window at the quietly chic (and aptly named) Le Petit Hôtel: a picture-postcard view of snow wetting the slanting stone streets of Vieux-Montréal. Right picture, wrong season. 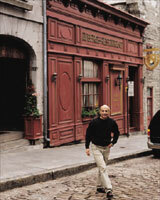 I run around the corner, up narrow Rue St.-François-Xavier and into a bistro called Garde Manger. Expecting an empty room, I pull back the velvet curtain on a packed house. There’s a fire going, tables of happy people eating steak frites, loud music, and one empty seat at the end of the bar. Two things the bartender says bolster my sense of being in the right place. One, they do half portions of the lobster poutine (their upgrade on that addictive Québécois absurdity, french fries with gravy and cheese curds, here topped with buttery chunks of lobster meat and a bisque-ish gravy), so I can in moderately good conscience order that and the bavette. Second, he says that this brief blizzard won’t faze the locals. “It’s been so nice recently,” he says, with a gentler French-Canadian take on the French shrug. “This makes us appreciate it more.” Whatever they’re talking about among themselves, the communal message of all these packed tables on a miserable wet Tuesday night is clear: we are unfazed. Above all, this is a city that takes its pleasures seriously. A little pre-summer snow is nothing, a reason to hunker down, light a fire, keep the dinner going late into the night. The sun is back the next day, snow an impossible memory, spring rejoined. On Rue Dante, in Little Italy, the young men are talking to the old men holding court at the little tables outside Caffe San Simeon. The young men stop for a moment, speak French, and keep on their way. Between one another, the older gentlemen speak Italian and sit smoking cigarettes, ignoring folded copies of Corriere Canadese. The women are elsewhere. We stop in for coffee to drink on a stoop with our natas, yellow custard-filled pastries we picked up at a nearby Portuguese bakery. Everyone pays with dollars decorated with the face of the queen. Inside there are Italian soccer flags on the wall and Italian soccer on TV. A graying Italian is making sandwiches. “What’s on those?” Gollner asks while we wait for our macchiatos to be fixed. The man looks up for the first time. One gray eyebrow shoots up, like the back of an agitated cat. We ask about the patron saint of the café. The easy ideas about Montreal are, like most easy ideas, somewhat right and mostly off base. The picture of Montreal as a kind of toy-size Paris on the St. Lawrence seems wrong, though I guess that Montreal is there if you go looking for it in the right neighborhoods, where all the restaurants have terrasses and all the boulangeries are staffed by nice girls flown in from Brittany. But as we make our way from Little Italy to Jean Talon, the city’s largest farmers’ market, it becomes clear that the city’s true identity is more nuanced than it seems on paper or in its language laws. Near the market, a store called Disco Maghreb sits across from Italomelodie. A Korean jewelry shop shares block space with a Vietnamese grocery. You will recognize Abu Elias, a large Lebanese takeaway grill and grocery, not by the name painted on the window but by its always-crowded corner parking lot. The cars are triple-parked, their drivers inside waiting on orders of kafta, shish taouk, or the mythical sujuk. Or they’re back in the car eating, transported by nostalgia, displaced or real, and hoping nobody appears to ask them to move. A Lebanese friend introduced Gollner to Abu Elias. “This is Beirut, exactly,” the friend had said, breathing in the smell of spices from the grill. If this is Montreal’s Beirut, then I guess we are in the Paris of the Middle East of the Paris of North America. It gets complicated. But inside, all is friendly disorder. One of the guys working the counter notices us noticing the cervelle, or brains, at the sandwich bar. “You try!” he says, pointing at his skull. Then he points elsewhere and emphasizes the soaring effects a good pressed brain sandwich with pink pickled turnips can have in the virility department. I can’t make any claims for it in that way, but purely as a sandwich (garlicky, piquant, creamily brainy) it is a firmly uplifting thing. We take our sujuk sandwiches and tamarind sodas to the car. Sujuk is a kind of dry sausage with many Middle Eastern variants. I’ve never been to Beirut, so I can’t say if this sujuk is faithful to the original. I can only say that at Abu Elias it is a deeply flavorful, oddly earthy, fantastically tasty, and somewhat confusing thing to eat. Confusing because it looks simple but then plainly isn’t: a grilled sausage, painted with garlicky aioli and wrapped in charred flat bread. But the taste just…keeps going. “Oh, my God,” Gollner shouts. I suggest that it’s like you stop chewing and the sujuk chews back at you. I know I’m not explaining it right. A light rain falls; cars arrive and want our parking space. We back out of the lot, still trying to chew and digest it all. One of the striking things about Montreal is that it doesn’t look like anywhere else. There are borrowed elements—bits that feel French, commercial strips that seem taken from any medium-size North American city’s downtown, houses that wouldn’t stand out in Boston. And there are architectural features unique to the landscape of the city, like the external staircases everywhere, protruding like exotic steel muttonchops from the faces of otherwise normal buildings. Mostly it is the jumble of it all that gives the place its singular feel, like pieces of a puzzle that don’t quite fit together but form a picture of something unexpected, lovely even: the elegant fieldstone buildings of the old city; the hulking industrial shells and silos along the water; the iconic Farine Five Roses neon sign, blinking on and off like a noir movie backdrop; the dainty pinks and greens and purples of the painted Victorian houses of the Plateau. It’s a college town, a dump, a city of art, placid parks, islands rigged for play and diversions, gray insular urban neighborhoods, and colorful suburbs. It is tiny by megacity standards but world-class in its weirdness, in its shifting, enduringly comfortable indigestibleness. I switch hotels and swap one Montreal world for another. The taxi trip between Le Petit Hôtel and Casa Bianca, a boutique bed-and-breakfast housed in a white Renaissance Revival house on Avenue de l’Esplanade, lasts only a few minutes but covers much territory. Moving north from the port you follow the chronological expansion of the city, leaving behind the tightly clustered stone buildings of Vieux-Montréal for the shady blocks of the Plateau and the wide-open expanse of Frederick Law Olmsted’s park around Mont-Royal, the not-quite-a-mountain at the center of the city. Casa Bianca sits at the corner of a long row of park-facing apartment houses—ornate mini-mansions in alternating architectural styles that are connected to one another and set back from the street by little lawns. Across the street are tennis courts and fields for soccer and running, and beyond that the soaring angel statue, the miles of hiking paths through park forests. I step out to watch the tennis players for a while in the early evening sun. At the edge of the park I pick up Avenue de Mont-Royal and take it east through the Plateau’s blocks and blocks of cafés, theaters, bookshops, and pretty tree-lined streets. At La Salle à Manger, a new bistro on Mont-Royal, I find a seat at the bar, near the charcuterie-hanging room and close enough to the kitchen to watch the action. A young dude in a baseball hat is arranging lobster and snow crab on pillowy slices of brioche. The place is humming, with white tiles and a tin-lined bar back; big doors open to the street. I order a glass of Brouilly. “Okay, I will get you drunk now!” says Alexandre, the barman, misspeaking but not wrong. “I mean I will get your drink.” Alexandre warns me the house charcuterie plate is a lot for a lone diner but supports my choice. Again, he’s not wrong. A full inventory of what was presented on this one wooden board—shredded jambon persillé; pork rillettes; headcheese with sweet carrots; a sweet, tart pickled tongue; an outstanding rabbit pâté in a jar—would take too long, plus the selection will have changed by the time you go. The thing is to go. It’s really good. I am dwelling on the food, I know. Forgive me. This is a city that dwells on its food. That celebrates its feasting. That has feasting at the core of its original mission statement. A couple of days later, I’m at L’Express, the old, vaunted, and still quite elegant bistro on Rue St.-Denis, having a drink with David McMillan, a chef and restaurateur who, with his partners, runs Joe Beef, Liverpool House, and McKiernan Luncheonette Bar à Vins in the once mostly Italian neighborhood of Little Burgundy, to the west of downtown. McMillan and I are discussing the central importance of food to the culture of the city and province. From the very dawn of settlement, then, there has been a specific, pleasure-driven approach to this wild and vast territory. McMillan is similarly determined, a swaggering, intelligent, combative, and extremely endearing and funny man. He is sort of the west-side Anglo complement to Martin Picard, the Québécois chef whose Restaurant au Pied de Cochon, on Duluth, is known for its hugely generous portions of foie gras poutine, duck-in-a-can, and seafood platters. McMillan and Picard—also bigger than life and instrumental in putting Québécois food on the food nerd’s map—represent the two biggest influences on Montreal’s current vogue for food that’s elemental, gutsy, and fun. McMillan can get very excited about any of his many interests—white Burgundies, women, the scourge of bottle service, the preservation of Quebec’s language, trains (he and his partner, the chef Frédéric Morin, are so into trains that they’re basing a chapter of their forthcoming book on cooking on the Canadian railways, bringing back to life such otherwise forgotten recipes as “dining car calf’s liver”). McMillan comes from Irish stock, but he is adamant that the province retain its French nature and language. We’re back in his car now, cruising around between neighborhoods he wants to show me. He pulls over and we go into Wilensky’s Light Lunch, a vigilantly unmodernized, nearly 80-year-old Mile End landmark deli where the one special—the “Wilensky’s special,” beef bologna and salami on a smushed toasted roll, mustard mandatory—is served with one option (cheese). We drink cherry Cokes from a fountain and eat our specials on stools unchanged since the place was featured in hometown literary star Mordecai Richler’s The Apprenticeship of Duddy Kravitz and the later film version of the novel. Uncertainty. Tension. The question of the survival of French as the dominant language. There is a kind of anxiety here, an always close-to-the-surface conversation about what the city is, where it’s going, and who it will become. Part of this is the natural consequence of a place divided between two languages and cultures: a province that nearly separated from the rest of the country—then didn’t. And part, I think, is a kind of reverse-aspirational, romantic notion the city has of itself as gritty and real. Whatever the macroeconomics, it is universally agreed that Montreal’s own uneasiness, its volatile internal dialogue, has preserved it as an interesting, creative, affordable, sometimes grubby, much-loved oddity. The sun is still out a few days later, streaming in the windows of Réservoir, a modern bistro where I’m having lunch with François Dufaux, an architectural historian. He calls Montreal “an imperfect America and improbable Europe.” It is at the periphery of both, is not quite either, and, as a result, is totally other. The divide between French and English neighborhoods dates to a time when the English were the dominant ruling class and built themselves housing in the west. The French were left to their own devices in the east. Nobody thought to make the neighborhoods connect. The streets literally didn’t run directly east to west, resulting in side-by-side isolation, a kind of de facto Checkpoint Charlie of obliviousness and mutual disregard. “Oh, that’s a bloody Ph.D. thesis,” Dufaux says in a soft French accent slightly colored by his university years in London. The short answer is that it’s an accident of Scottish builders’ influence in the 19th-century development of the city. Whereas displaced Londoners were accustomed to row houses and leaseholds, the Scottish tradition was for year-to-year rentals built on top of one another. When the city imposed new setback laws to encourage green front lawns, the habit of building cheap staircases in back, to maximize interior space, moved street-side and mainstream. I have a theory to try out on him, I tell Dufaux. I am sure it will be a deeply unpopular suggestion. My theory is this: That despite the very real and lingering political tensions between francophone and Anglo, despite a culture of political intrigue and complaint, despite the crushing winters and all the inherent imperfections, compromises, and contradictions of the city—despite it all, Montrealers are happy. Or actually: not despite but because of these things. My idea is that this is what life in a complicated, beautiful city should be. We want to fight with one another but live in close proximity. We want challenges, but not too many. We want alliances and enemies and intrigue, but not at the expense of, say, good bistros with excellent French wines and an extensive, public, well-designed bike-rental system that works. More than anything, we want to feel a part of something worthy, somewhat threatened and singular. It’s the mix that keeps you off balance, interested. To experience it, just find the nearest Bixi. The aluminum-gray bikes are in little rental stations everywhere, part of the public bike system launched last year. One day I meet up with a young francophone journalist named Judith Lussier. She recently wrote a book devoted to the lowly dépanneur, the indigenous Québécois version of the corner convenience store. Deps, as they’re called, are a part of the city fabric you don’t really notice—until you do. The dep sells cigarettes and lotto tickets, wine and beer—and, crucially, delivers the latter during Habs hockey games. Lussier mentioned a classic dep called Le Pick Up, which has a sandwich counter and had recently been turned into a popular hipster lunch hangout. So I find a Bixi stand near Casa Bianca and swipe my credit card for deposit; the front wheel clicks unlocked, and I’m free to zip up the side streets north of the park, along empty industrial blocks, past the corner of Rues Mozart and Marconi, and onto a street lined with auto shops and Italian bakeries, the air fragrant with fennel seed and motor oil. Le Pick Up is as advertised: a corner grocery store that sells artisanal pulled-pork sandwiches and attracts an arty bilingual crowd, but still has its takeaway beer fridges, racks of candy, and the rest of the classic conveniences. After lunch, my cycling route is circuitous, serendipitous, aimless in a good way. Down through Little Italy, past the church with its mural of Mussolini and the Pantalon Napoleon factory and a store selling ancient sewing machines with brand names like Brute and Blue Streak. The No. 18 bus crosses my path, its route sign flashing the words Go…Canadiens…Go. I push along the Avenue Laurier, peeking into the windows of Les Touilleurs, the best-curated kitchenware store in the world, then turn down Rue St.-Denis, past L’Express and, as gravity takes me down the hill, I glide past the bar-lined Latin Quarter, its terraces packed with McGill students laughing in the sun. I mean to head back to the hotel but the city has a hold on me now. I sweep past the Cirque Éloize practice studios in the old Dalhousie train station and down through the tight stone alleys of the old city. I ride along the quays of the port, past the blue and yellow peaks where I plan to see Cirque du Soleil in a few nights, and east along the water where a bike path leads under a snaking highway and over the Canal Lachine. Montreal by bike—the experience of swiftly shifting landscapes, cities giving onto other cities, ever more to explore. Eventually I stop, just to stop, because I’m tired. But there’s more to see, more paths to follow. I stop and walk a bit, wobbly from the ride and the sense I’d covered more ground than was possible in a brief afternoon exploration. But the city keeps on going, always going. Adam Sachs is a T+L contributing editor. Great Value Casa Bianca 4351 Ave. de l’Esplanade; 866/775-4431; casabianca.ca; doubles from $123. Hôtel Le St.-James Glamorous rooms in an 1870’s bank building. 355 Rue St.-Jacques; 866/841-3111; hotellestjames.com; doubles from $387. Great Value Le Petit Hôtel 168 Rue St.-Paul Ouest; 877/530-0360; petithotelmontreal.com; doubles from $186. Boucherie Abu Elias 733 Blvd. de la Côte-Vertu; 514/747-7754. Caffe San Simeon 39 Rue Dante; 514/272-7386; coffee for two $5. Cluny Art Bar Funky little art gallery and café housed in a former foundry. 257 Rue Prince; 514/866-1213; lunch for two $50. Dépanneur le Pick Up 7032 Waverly; 514/271-8011; lunch for two $20. Garde Manger 408 Rue St.-François-Xavier; 514/678-5044; dinner for two $47. Joe Beef 2491 Notre-Dame Ouest; 514/935-6504; dinner for two $95. Kaizen A chef hangout with great sushi. 4075 Rue Ste.-Catherine Ouest; 514/707-8744; dinner for two $70. La Salle à Manger New French bistro specializes in house-cured charcuterie. 1302 Ave. du Mont-Royal; 514/522-0777; dinner for two $90. Le Club Chasse et Pêche Serves outdoor lunch in the historic Governor’s Garden. 423 Rue St.-Claude; 514/861-1112; lunch for two $61. Les Cons Servent 5064 Ave. Papineau; 514/523-8999; dinner for two $60. L’Express 3927 Rue St.-Denis; 514/845-5333; lunch for two $70. Liverpool House 2501 Notre-Dame Ouest; 514/313-6049; dinner for two $76. Mas Cuisine Chef Michel Ross creates a dynamic menu in this neighborhood hideaway. 3779 Rue Wellington; 514/544-3779; dinner for two $100. McKiernan Luncheonette Bar à Vins Happy hour starts at noon at this 12-seat luncheonette. 2485 Notre-Dame Ouest; 514/759-6677; lunch for two $23. Réservoir Lively lunch spot and bar in the Plateau. 9 Rue Duluth Est; 514/849-7779; lunch for two $25. Restaurant au Pied de Cochon 536 Rue Duluth Est; 514/281-1114; dinner for two $130. Rotisserie Portugalia 34 Rue Rachel Ouest; 514/282-1519; dinner for two $30. Rotisserie Romados 115 Rue Rachel Est; 514/849-1803; lunch for two $20. Schwartz’s Legendary home of Montreal’s “smoked meat.” 3895 Blvd. St.-Laurent; 514/842-4813; lunch for two $15. Sparrow Mile End hot spot known for its weekend brunch. 5322 Blvd. St.-Laurent; 514/690-3964; brunch for two $30. Wilensky’s Light Lunch 34 Rue Fairmount Ouest; 514/271-0247; lunch for two $14. Buvette Chez Simone Trendy wine bar popular with the late-night crowd. 4869 Ave. du Parc; 514/750-6577; drinks for two $15. Dieu du Ciel Casual microbrewery with its own cask ales. 29 Ave. Laurier Ouest; 514/490-9555; drinks for two $12. Dominion Square Tavern Grand, newly reopened downtown space has a lengthy history. 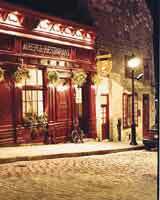 1243 Rue Metcalfe; 514/564-5056; drinks for two $17. Pullman Sleek wine bar decorated by owner/designer Bruno Braen. 3424 Ave. du Parc; 514/288-7779; drinks for two $20. Les Touilleurs 152 Ave. Laurier Ouest; 514/278-0008. Monastiraki Eclectic Mile End space that’s one part antiques shop and one part gallery. 5478 Blvd. St.-Laurent; 514/278-4879. Bixi Bikes Public bike system offers 24-hour service at 400 docks around the city. 514/789-2494; bixi.com; from $5 a day. Marché Jean-Talon Largest outdoor market in North America. 7070 Ave. Henri-Julien. Open since 1980, the restaurant is still the spot for expertly prepared French classics such as the generous pot-au-feu or the citrusy octopus-and-lentil salad. Once you have the gourmet accoutrements from the Les Touilleurs kitchenware store, cab it up to Little Italy and this enormous food market, which is the city’s culinary epicenter. Here, you can stop by the William J. Walter boucherie for—count ‘em—more than 50 kinds of sausage; at La Fromagerie Hamel you can sample from dozens of raw-milk, unpasteurized cheeses that you won’t find stateside. Before you leave, pick up a package—or three!—of sugary, leaf-shaped bonbons d’érable (maple candy) at the farmers’ stalls in the center of the market. Evidence that Montreal designers can compete on the world’s stage: the glorious interior of Pullman, which merges mid-century modernism (polished wooden tables, stone floors, and a palette of gray, black, and cream) with a hint of 21st-century baroque (a multitiered wine-glass and champagne-flute chandelier). The trilevel bar and restaurant is co-owned by designer Bruno Braën, who also created the distinctive look of the restaurant Club Chasse et Pêche. But it’s not all about design here. The place is popular among Montreal’s bons vivants (reservations are recommended) for its extraordinary—yet gently priced—wine list. There’s also a menu of sweet and salty snacks, so you can start (or end) the evening with a glass of 2003 Erdener Pralat Riesling Auslese and a perfect little endive and hazelnut salad. Proof that Montreal is an epicurean’s dream: this exquisitely ordered kitchenware store in Outremont’s poshest shopping neighborhood. The marble counters are piled with gleaming gourmet equipment, including Italian-made Guzzini serving spoons with mod yellow handles, Revol French culinary pottery, and Quebecer Tom Littledeer’s austere maple cooking paddles. After doubling its size in 2005, it now offers in-store cooking classes from local chefs. With most of the city’s top hotels near the old city, many a traveler interested in exploring the boutiques, restaurants, and lounges of Montreal’s colorful central neighborhoods (Le Plateau, Outremont, Mile End) has been forced to shuttle to and fro via taxi. It was a welcome relief when this serene five-room inn opened in 2006. The landmarked French Renaissance Revival building has beautiful historic details, including wrought-iron stairs and a terra-cotta fountain in the front hallway. The owners take the Bianca (white) theme seriously, with very little color in the rooms save for blond-wood floors and bright green and red bedspreads. But quirky little touches—a John Currin–style painting in the upstairs Rachel suite, an all-organic food-and-furnishings approach—warm the place up considerably. Room to Book: Marie-Anne may not be the quietest of rooms (it’s set near the front door and the breakfast nook), but it’s the largest and most stylish, with a spacious sitting room and abundant wainscoting. Located in the Mile End area, Wilensky’s Light Lunch serves unfussy sandwiches and fountain sodas. Opened in 1932, the restaurant was made an icon by Mordecai Richler’s The Apprenticeship of Duddy Kravitz (1959). Today, patrons sit at one of nine counter stools at the Jewish diner and order the house special — a bologna and salami sandwich pressed in a plancha-like grill. Served on wax paper, the sandwich comes with rules: it always has mustard and is never halved. Wilensky’s makes soda-fountain cherry Cokes and homemade egg creams (chocolate syrup with soda water and milk). Réservoir's large arched windows open in summer and its second-floor terrace overlooks raised-bed gardens and iron lampposts along cobbled Duluth Avenue. Bare wooden tables and beer vats fill the brasserie-style brewpub. During weekend brunch hours, the house-made, microbrewed beers accompany dishes like smoked lard and poached eggs, or salmon gravlax with kimchi and avocado purée. At lunch and in the evenings, the menu is more pub-style, with haddock-and-chips and more upscale bar snacks like charcuterie plates and tuna tataki. For dessert, there's a chocolate pot de crème with dulce de leche and a sprinkle of fleur de sel. Liverpool House sits next-door-but-one to sibling restaurant Joe Beef and serves market-sourced dishes cooked in French and Italian styles. Daily specials and mainstay offerings by chef Frédéric Morin are marked on a chalkboard and range from mushroom-Gruyère tarts and lobster pasta to osso bucco with ricotta gnocchi. The fitting wine list is heavy on French and Italian bottles, yet the overall Canadiana feel comes from the decorative animal antlers, canoe, and Peter Hoffer paintings. From the Little Burgundy neighborhood it’s a five-minute walk to the Lachine Canal and fresh produce stalls at the Atwater Market. Opened in 2007, Les Cons Servent is a play on words, alluding to the bistro's home-canned preserves, conserves, and pickles that are stacked on ceiling-high shelves in the gray-tone dining room. Made-in-house specialties include toasted pecans, strawberry vinegar, and quail eggs in black tea. A 150-label wine cellar consists of privately imported bottles that, like the preserves, are available for take-away sales. The market-driven French menu includes dishes like venison tartare and pan-fried snapper with chorizo and Jerusalem artichokes. For an uncommon dessert, try the pear fritter topped with caramel and bacon bits. One part restaurant, one part late-night bar, Garde Manger offers innovative seafood and a seat at the hottest party in town. Set in a historic Vieux-Montréal building, the dining room keeps things rustic with exposed-stone walls, chalkboard menus that change often (try the spicy General Tao lobster and jerk shrimp), and brown paper covering a collection of wooden tables. After midnight, the music is turned up (loud) and the restaurant fills with thirtysomethings in their hip finery. Don’t miss the enormous (almost eight-foot-wide) chandelier, ripped—or so it appears—straight from the dining hall of a pirate ship. Set among Vieux-Montréal’s cobblestoned lanes, this eatery is marked only by the antler-and-fish crest hanging outside the door (appropriate, since chasse et pêche means “hunting and fishing”). Inside, the atmosphere is dark and full of disorienting design touches (old-school leather club chairs combine with mod white ceramic birds taking flight from low-hanging glass pendant lights), and the tables are spread through a pair of little dining rooms with an excellent soundtrack overhead (dub and reggae are often on the playlist). The dishes, which pay homage to both gun and rod, are surprisingly light. Try the striped bass with asparagus and sorrel in a risotto-style Parmesan sauce, or the rabbit and lobster gnocchi. In summer, the restaurant also has tables on an outdoor terrace just across the street in the garden of the historic Château Ramezay. The terrace is open only on weeknights, and tables go quickly. Be sure to book in advance. Stepping into the St-James feels like stepping back into a genteel, Gilded Age manse. Housed in a gracefully restored 19th-century bank building just a few blocks from the Notre-Dame Basilica, the hotel’s large guest rooms are piled with Oriental carpets, antiques and paintings from the owner’s private collection, yards of chintz drapery, leather button settees, and enormous wooden beds. This lively restaurant, manned by chef Martin Picard, has earned a cultlike following both within the city and abroad for its obsessive (and inventive) preparations of all things meat. Inside, the atmosphere is pitch-perfect habitant: rollicking, fiddle-heavy Québécois music plays on the stereo, and the menu features no less than nine permutations of foie gras: in a tart, in a terrine, on poutine, and with boudin (Mon Dieu! ), to name a few. 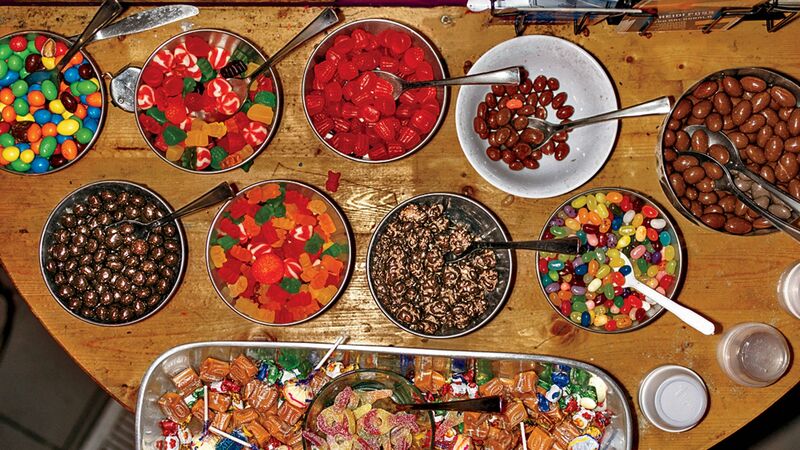 Be warned: dishes are absurdly copious and rich, if you hadn’t figured that out already. Chef-owners Frédéric Morin and David McMillan are the mavericks behind Joe Beef, a delightfully disheveled counterpoint to the city’s often overstyled restaurants. The décor (a bear’s head trophy over the bar; rustic wooden tables; très country checkered napkins) verges on irreverent, but the food is far from it. Though oysters and crab cakes make a cameo, the emphasis here is decidedly Québécois—heavy on meat, with healthy doses of foie gras and boudin, served with a poached egg. Morin and McMillan’s antiestablishment stance has worked so well that their peanut-size dining room in the up-and-coming Little Burgundy is now a favorite of both the city’s star hockey player, Saku Koivu, and the Quebec premier, Jean Charest. Lunch on pressed charcuterie sandwiches at Cluny ArtBar, a funky little art gallery and café housed in a former foundry. Opened in 1928, this kosher-style Jewish deli marinates its meat for 10 full days before hot-smoking it. The preservative-free beef brisket (similar to pastrami) is ordered by the fat content: either fat, medium-fat, medium, or lean. All tables are communal; counter seats overlook the busy meat-slicing area. The classic order is a smoked-meat sandwich with a side of fries and half-sour pickles. Daily lunch lines form along Montreal’s “Main Street,” Saint-Laurent Boulevard, so in 2008 the restaurant expanded with a take-out counter next door. By noon, there's still an hour-or-more wait. The brewing tradition is alive and well in Quebec, nowhere more so than at this excellent, nothing-but-the-basics microbrewery just a few blocks east of Laurier’s tony boutiques—far enough away, that is, to maintain its authenticity. Inside, the wooden chairs and tables are appropriately worn and stained, and the stainless-steel fermenting casks gleam brightly. There are more than a dozen beers on tap, including Irish cream ales, smoked porters, and cask-conditioned IPAs. The easy-to-drink Belgian Trappist–style Rigor Mortis ale is particularly delicious; at 10.5 percent alcohol, its name serves as a fair warning. A cheerful after-work crowd heads to this trendy wine bar for locally brewed McKeown cider and tasty bar snacks like grilled calamari and olives marinated with fennel. This neighborhood bistro hits all the marks of Nouvelle Montréal cuisine: taxidermy in the dining room, chalkboard of nose-to-tail specials, and scruffy hipster chefs in baseball caps. Chef Samuel Pinard and his gang of six make almost everything in house—from pastas and bread to the cured sausages hanging in the glass meat locker. Sit at the bar amid the regulars snacking on plates of sublime pork rillettes and rabbit pâté. Housed in two buildings, including an old leather factory from the 19th century, the 24-room hotel appeals to young entrepreneurs with its tech-savvy touches like free Wi-Fi and plasma TV’s outfitted with Wii Fit stations. A Parisian Boîte in Montreal—Mais Oui!